One of the common attributes Michiganders share is how much we appreciate summer. We fill every summer day and night to the brim because we know it’s just a brief respite from winter. One of the best ways to maximize your summertime enjoyment is by making the most of your outdoor living space with a deck. Whether you have a sprawling country home or live in an urban or suburban setting, a new deck can add hours to your summer and increase the value of your home. Maybe you have a neighbor with a beautiful deck you admire, or you saw several in a magazine that appealed to you, each in a different way. Now you’re not sure what you want in your new deck. The best way to determine what you really want is to look at the different options available and make choices, one by one, until your dream deck design wish list is complete. Let’s get started! 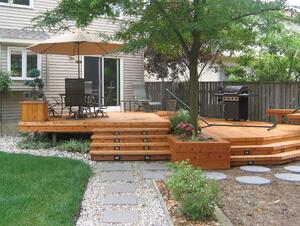 Uses: To begin, think utility: What do you want to be able to do on, around or even under your new deck? For example, if you have a pool, do you want the deck to extend poolside space? If, like many people, you want to use your deck as a summertime kitchen and dining room, do you want separate areas for preparation and eating? Considering entertainment, will you be having large parties on the deck, smaller dinner get-togethers, or a mixture of both? And then there’s the best reason of all to build a new deck … relaxation. Our chances to spend time outdoors with a good book, listening to a baseball game, or cat-napping are simply wonderful, if fleeting. 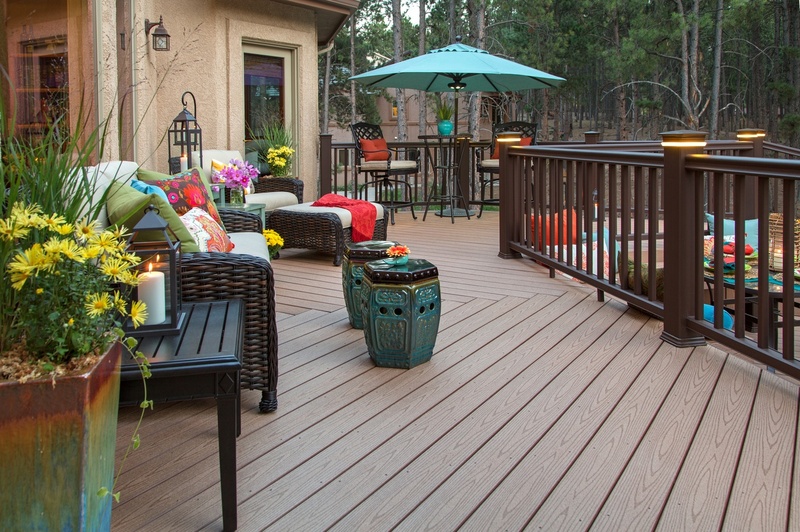 A deck is the perfect place to just kickback, relax and enjoy! Levels: After you thoroughly consider all the ways you’ll want to use your deck, the next step is to consider levels. For many people, a main level with step-down tiered levels to the ground is perfect. For others, especially those with hilly lots and multi-level homes, a second-story deck can provide not only living space off the main level of the home, but can also allow for installation of a dry under-deck system. These systems create an under-deck area that is well-drained and useable for additional outdoor-living space. Curved or straight lines: A well-made deck can truly be a work of art, especially if you want to incorporate curves into the shape. A deck that bows around a pool, encircles a hot tub, or is curved to accommodate a gazebo or other structure creates a beautiful flowing design. Due to the difficulty of bending wood, however, a curved deck is a job for experienced experts only. Another option is TREX® composite deck boards, which can be bent using a proprietary system. Again, a curved composite deck should be left to the experts with experience. Lighting: Today there are so many new and exciting lighting options, you no longer have to settle for the glare of a spotlight to enjoy your new deck at night. Decks can now have built-in running lights, deck rail lights, sconces, spotlights, solar-powered lights, and more. Consult with your contractor about the best lighting options so they can be incorporated into the overall deck design, not added as an afterthought. Incorporating natural features: Sometimes yards have special features like beautiful old trees, hills, large boulders, and ponds that can remain a part of your yard by building around them. Imagine a bench around the base of that old oak tree or a deck built to accommodate the hill with useable dry space underneath. A qualified and experienced contractor can make the most of every foot of your yard without sacrificing natural beauty. 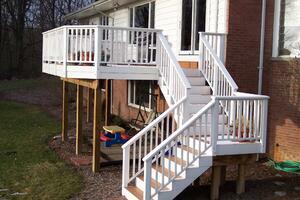 All decks that are 30 inches or more above grade must have railings, however, railings are more than just for safety. 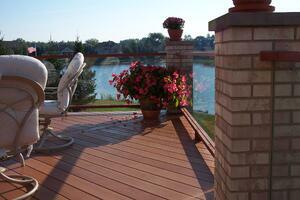 For many decks, the railings set the style of the deck, which in most cases is an extension of the home. 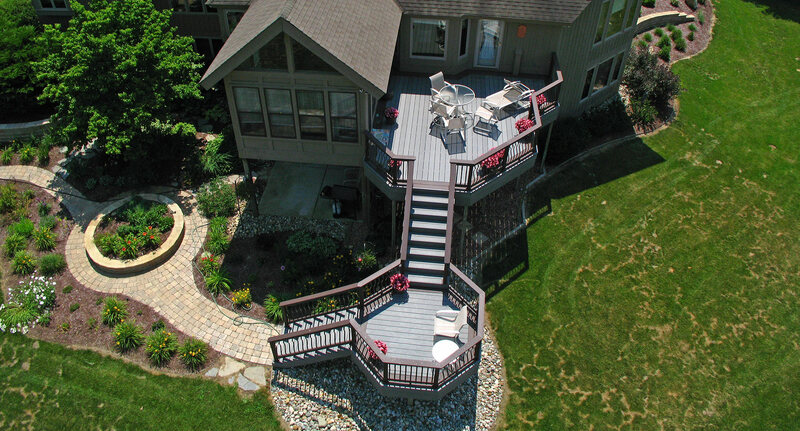 Choosing the right railings can take your deck from ordinary to extraordinary! So while railings will keep people from falling off, they won’t stop them from falling in love with your new deck! Here’s a roundup of styles to consider. Contemporary: If your home is contemporary or modern, you will want to continue the design with deck railings that follow the same lines and share color shades and/or materials. Designs often have clean straight lines defining uncluttered spaces surrounded by deck railings of a variety of materials from wood and composites, to wrought iron and aluminum, to rock, concrete, and even glass. Colonial: Colonial deck rails are classic Americana and easy to assimilate into the style of just about any colonial home. Typical components are made of wood or composite and include touches like traditional balusters (or spindles) with classic shapes reminiscent of the colonial period. Traditional: Perhaps the most common deck rail is the traditional style that blends with many different home styles thanks to its simplicity. Like contemporary deck railing, however, there are many variations available composed of different materials, shapes, colors, and hardware. Rustic: Among the most creative and inspiring looks for deck railings is the rustic look. Whether you have a log home or just love how the rustic look could enhance your home, the sky’s the limit. Rustic rails can use everything from birch logs to sturdy branches to rebar for balusters (to name a few of the possibilities) and when well-designed, blend well into natural settings. When you’re planning your deck design, don’t forget to consider how structures can be included to provide shade and privacy, and to enhance your deck and yard over all. 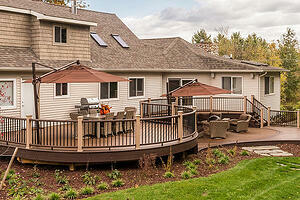 Another aspect to consider in your deck design is an addition. If your family needs more living space, an addition could be just the fix. Since many additions are built on the back of homes where decks are also built, factoring your addition into the design and construction process will save you time and money long term. Here’s a look at some of the possibilities. Pergolas: A structure that goes back centuries, pergolas were traditionally found in gardens and have open sides and an open trellis-like roof designed to support vines that create a shady area underneath. In modern use, pergolas have slatted tops that provide shade, and may or may not have vines covering them. Like decks, pergolas can be built with wood or using composite materials like Trex®, and are common additions to decks where space permits. Gazebos: Also an old architectural form, gazebos are often called pavilions. They are usually free-standing structures with solid roofs and may be open sided or semi open with railings around the perimeter. 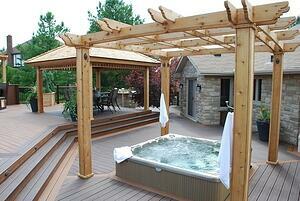 Gazebos can embrace just about any style home and may be simple or ornate. They can also be built into a deck to provide a protected area. Sunrooms: These home additions include screen rooms, and three- and four-season rooms that let the outdoors in during the warm months, and if winterized, keep the cold out year-round. Combined with a deck, a sunroom offers a place to enjoy the outdoors without bugs, heat and humidity in summer, and to stay warm watching the snow pile up in winter. Privacy solutions: All of the above offer privacy, but there are other ways to make your deck private on a smaller scale. Drapes, screens, lattice walls, drop shades, and trees, bushes and climbing plants can also be included in a deck design to ensure your deck makes all your dreams come true! Until the last 25 years, decks were made of wood. In Michigan, however, the weather — heat and humidity, frigid cold and snow, freeze and thaw — brought about the need for a lot of maintenance to keep a deck in good and safe shape. Even with all the necessary painting, sealing, staining, and power washing, wooden decks in Michigan remain subject to fading, splintering, rotting, swelling/warping, mold, mildew, and insects. And in the summer when you need it most, a deck can be blistering hot. Trex® composite decking was created in 1996 and addressed all of the above problems associated with wooden decks, as well as associated environmental concerns. Trex® is manufactured from recycled wood (reclaimed sawdust that would have been landfilled) and recycled plastic film (bags, wrappings, etc.). The result is a composite deck material that is 95 percent recycled and has earned many U.S. Green Building Council environmental awards. Each composite deck board is wrapped on three sides in a high-performance shell that resists fading, mold, stains, and scratches. Comparing decks made of Trex® and decks made of wood painted the same color, the wooden deck has been found to be hotter. Trex® composite boards undergo rigorous quality control to ensure each one meets company standards. No such quality control is ensured with a lumber delivery, which can contain several warped or otherwise unusable boards. For decks with curves, Trex® makes it easy thanks to its proprietary Custom Curve System®. Virtually all Trex® products are covered by a 25-year limited residential warranty, and high-performance products carry an additional 25-year limited residential fade and stain warranty. Trex® is available in more than 20 colors and several grains. Using Trex®, however, does not preclude the use of wood, stone, tiles, and other materials as desired. Many decks are constructed with a combination of materials that work together to create the atmosphere, ambiance and durability desired. Trex® also offers the RainEscape Deck Drainage System®, that allows for the renovation and use of otherwise wet or damp areas, such as those under elevated decks. The system has a 20-year warranty. 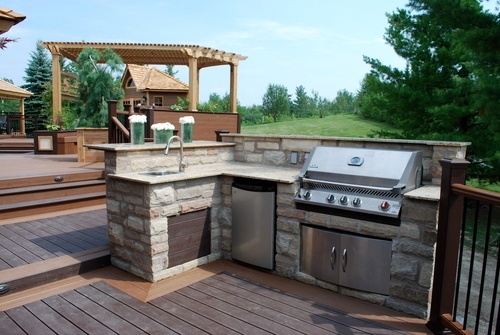 No matter what your deck dreams entail, Custom Built can make them a reality. 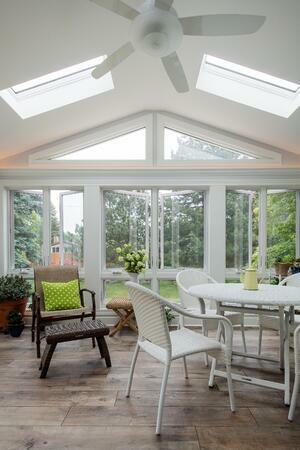 Take a look at our work in our Remodeling Photo Gallery and start dreaming today!